We do forgive them the plastic pots – but they have seen the light now. 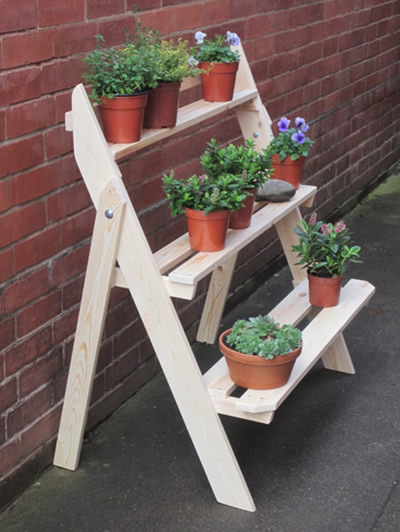 As can all of your plants arranged on this ladder planter, or step planter or ...... Oh you name it ! Tanalised wood planks screwed together ( or to be more precise, you have screwed together) can be quite common really. But this one is certainly not common. Quite simply, there will never be another one the same as yours ! Your planter will be especially handmade for you, and we can maybe ‘customise’ it a bit to make it just to your liking. 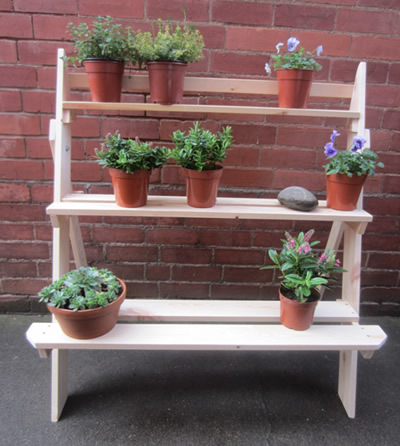 We really are proud to offer this totally handmade ladder planter. Yep, mass produced is cheaper, but nothing produced in a far eastern factory will ever be made with the same love and care as this planter. A planter rack which is quite nice enough to become a piece of furniture ! Now down to the nitty gritty, the ladder planter dimensions. Your Ladder of Plants will brighten up any area of your garden, just think of all those plants cascading down. 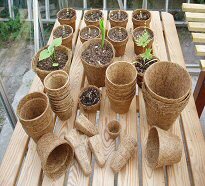 Your planter will be pre treated with ‘ Life Time Wood Treatment’ and I will include 10 ‘ Coir Pots’ along with a packet of ‘ Mycorrhiza’ that really amazing root stimulus. Your ladder rack will be a riot of colour, or herbs or, well anything you like really, in absolutely no time !